Snip through shells of shrimp along back using kitchen shears, exposing vein and leaving tail and last segment of shell intact. Devein shrimp leaving shells intact and toss shrimp with 2 tablespoons of the oil, garlic and ½ teaspoon salt. Marinate at cool room temperature for 15 minutes. In a medium bowl, stir together the beans, onion, marjoram, rosemary, 2 tablespoons of the olive oil, the lemon zest and juice. Season to taste with salt and pepper and set aside. Bring 3 cups of water to a boil in a small saucepan. Set up an ice bath next to the stove. Plunge the mint leaves into the boiling water for 30 seconds, then drain and add to the ice bath. 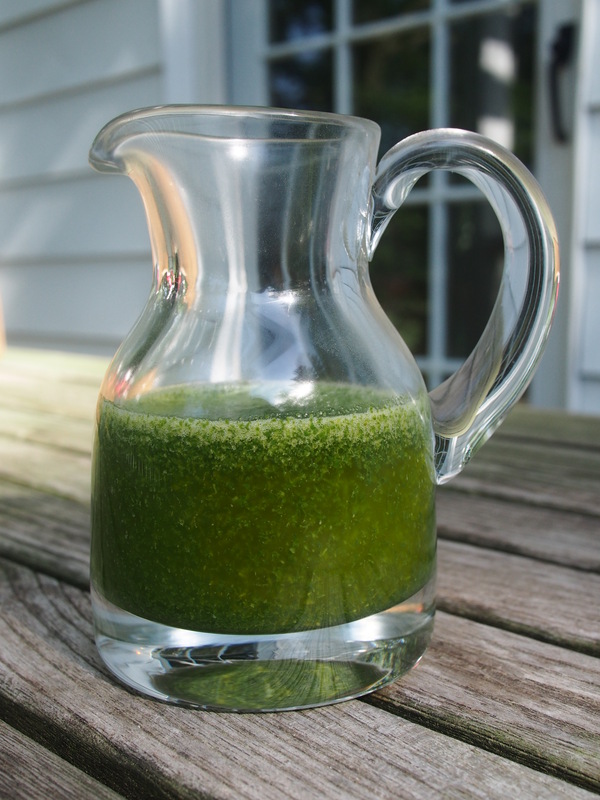 Once the mint is cool, drain, squeeze any excess liquid from the leaves and transfer to a food processor. Add the remaining ¾ cup olive oil and process for 1 minute. Set aside. 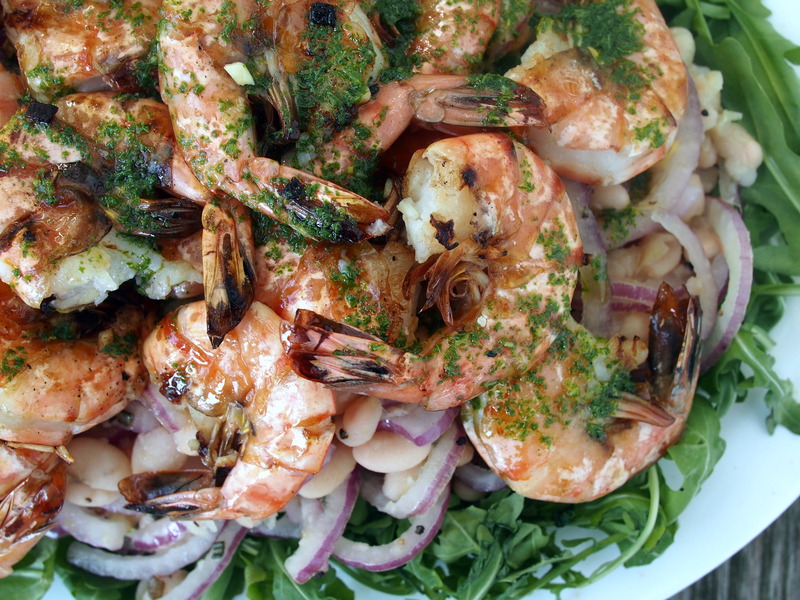 Grill shrimp (covered only if using a gas grill) on their sides on an oiled rack set 5 to 6 inches over glowing coals until shells are pink and slightly charred and shrimp are just cooked through, 3 to 4 minutes on each side. (Alternatively, grill shrimp in a hot, well-seasoned ridged grill pan over moderate heat for about the same time period, turning once). Meanwhile, mix the arugula with the beans and arrange in the center of four plates. 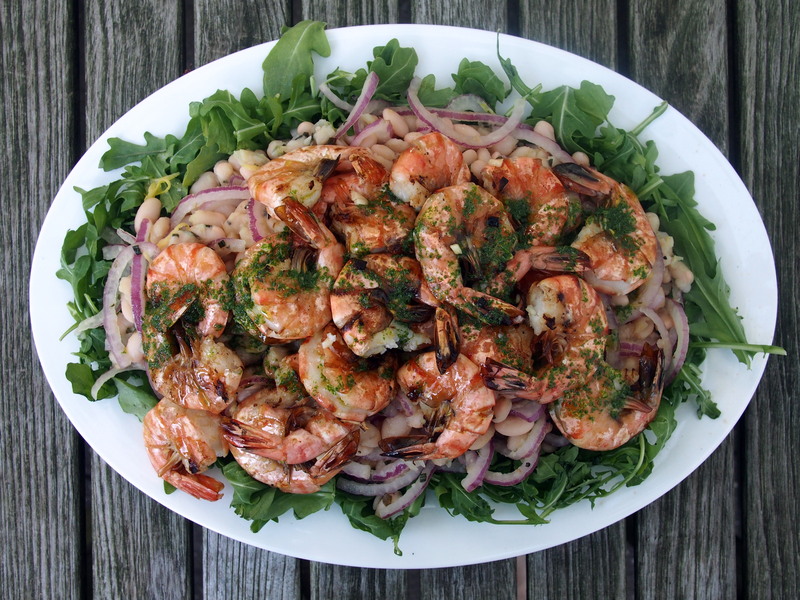 Arrange 3 shrimp on each plate, leaning them against the arugula and beans in lounge chair fashion. Drizzle with the mint oil and serve. Posted in ShrimpBookmark the permalink.